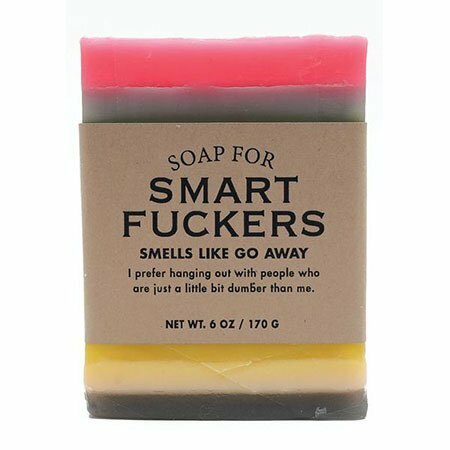 Soap for Smart Fuckers: Smells like go away. I prefer hanging out with people who are just a little bit dumber than me. Whiskey River Soaps are hilarious and they make excellent gifts. Also, they have the added benefit of cleaning things when you add water to them and rub. Amazing! All Whiskey River soaps are handmade, so no two look exactly alike. Ingredients: Coconut oil, palm oil, safflower oil, glycerine, purified water, sodium hydroxide, sorbitol, sorbitan oleate, soy bean protein, coloring, fragrance. Check out all our Whiskey River Soap options here!